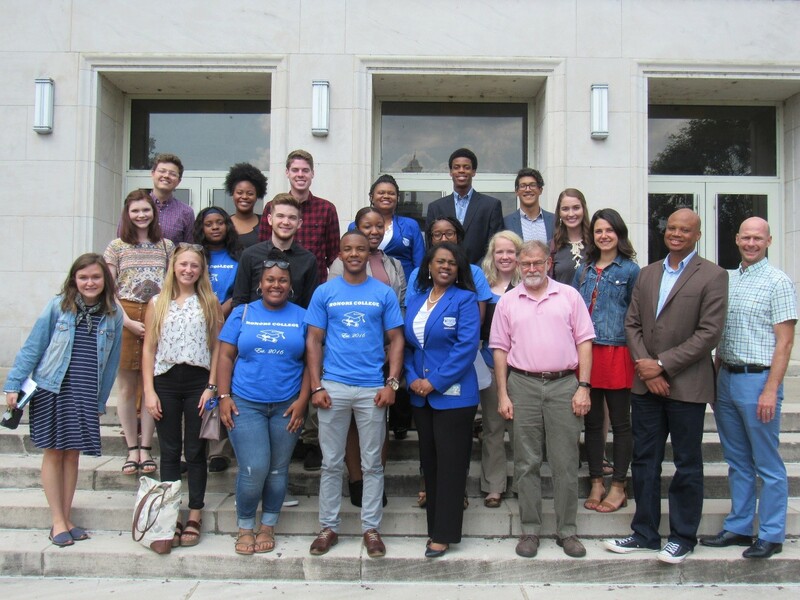 Honors College students from Belmont, Fisk, Lipscomb and Tennessee State Universities recently met at TSU for the first meeting of the Nashville Honors College Consortium and leadership workshop. Dr. Jonathan Thorndike, director of Belmont’s Honors Program, organized the meeting in collaboration with Dean of the TSU Honors College Dr. Coreen Jackson and Belmont Faculty Member Dr. Beverly Schneller. The Honors College directors discussed the advantages of programs for students and their philosophy of leadership. The students met to discuss ideas for future projects including social events, service events, cultural events, case studies workshops and panel discussions. Students discussed ideas for a future service events to help with the Walk for Cervical Cancer, volunteer for disaster assistance work groups and communicate on future Nashville-wide collaborative programs. Pictured above are Sarah Everett, junior journalism major (front row, left); Miriam Turner, junior music therapy junior (front row, second from left); Steven Metrejean, sophomore music business major (second row, 3rd from left) and Dylan Arndt, junior music business major (back row, left). All are members of Belmont’s Honors Program and the Honors Student Council leadership team. Also pictured above are Dr. Jackson, Director of the Lipscomb Honors College Dr. Paul Prill, Associate Director of the TSU Honors College Dr. Tyrone Miller and Director of the Fisk Honors College Dr. Patrick Fleming.